How much do they cost and how do I order? Step 1: Fill out the “Enquiry Form” on this page. Indicating which Option/s (see below) you require. Step 2: Submit the form and we will get back to you quickly by email to confirm your delivery date and provide you a link to our prices and ordering page (no obligation). Email your photos and make secure payment. You then simply sit back till it arrives on your specified date. Step 3: You present the unforgettable personalised original artwork to the overjoyed recipient and immediately have praise and love showered upon you! Easy! NOTE: You can get me to create whatever you have in mind or leave it totally up to me. 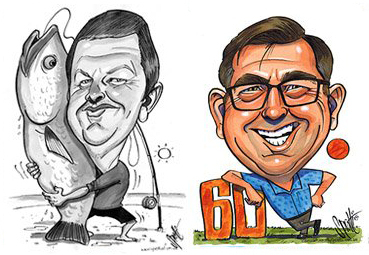 Each caricature is a completely original piece of artwork – no templates here so let your imagination run wild. You can include extra people and as many details as you want. 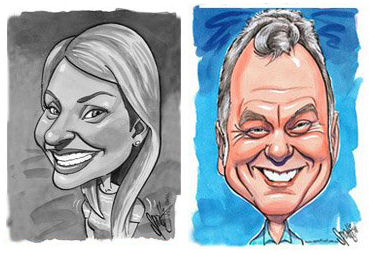 I create caricatures for individuals, couples and groups. 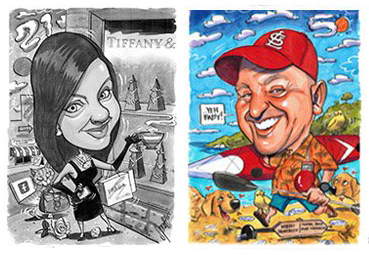 You get the Customised Original hand-drawn and painted Artwork AND a FREE Bonus Digital Copy! You give the original and get a free digital copy to keep for yourself. Original Hand-Painted Artwork plus a FREE digital copy. Can include short caption (eg. Happy Birthday, Farewell etc.) B/W or Colour. Original Hand-Painted Artwork includes 1 FREE detail plus a FREE digital copy. B/W or Colour. Can include extra people and details. Original Hand-Painted Artwork 2 FREE detail plus a FREE digital copy. Also available in A2 size. B/W or Colour. Can include extra people and details. Note: Details are extra and can include favourite sayings, hobbies, occupation, favourite drink, pets etc. Note: Each individual item is classed as one detail eg. Detail 1 – dog, Detail 2 – cat, Detail 3 – Favourite drink, etc.